The physical reaction our bodies have to the stress and anxiety experienced by our brains can be debilitating for many students but it doesn’t have to be. There are proven breathing exercises that can truly help alleviate the physical reactions our bodies experience when stressed and in turn, when relaxed, our bodies can help slow down our minds. This week’s #MentalHealthMonday video shares 4 of these techniques. Some can help alleviate the stress in the moment and others are good preventative exercises that can be done daily to help fend off the physical reactions to stress. Take a deep breath and hold it as you curl your toes for about 5 seconds, then let your breath go all at once. Don’t ease off — let go completely! Next clench your calves, thighs, buttocks, arms, shoulders, jaws and finally squeeze your eyelids. Tense your muscles, one area at a time, and relax everything upon release. Take a deep breath using your abdomen, ensure it expand fully. Hold it in for about 3 seconds. As you exhale, be sure to relax your jaw and shoulders. With your eyes closed, shift your attention to the tip of your nose. As you inhale deeply, become aware of the air entering your nostrils. Exhale but be aware of the sensations of air passing back out through your nostrils. Inhale quietly through your nose for 4 seconds. Recommended that you do this once in the AM and once in the PM regularly. Share with students in your circle of friends and/or family. 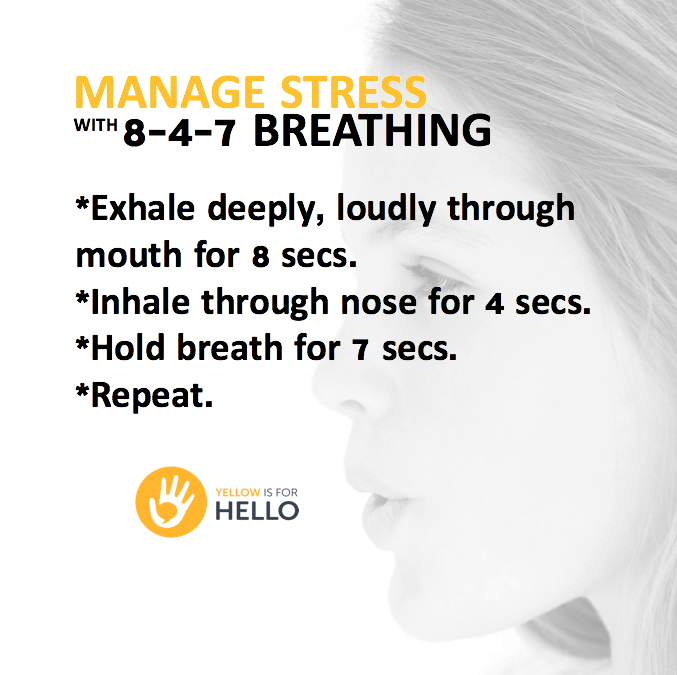 See these and more “one-minute breathing exercises” by the University of Michigan’s Student Services.